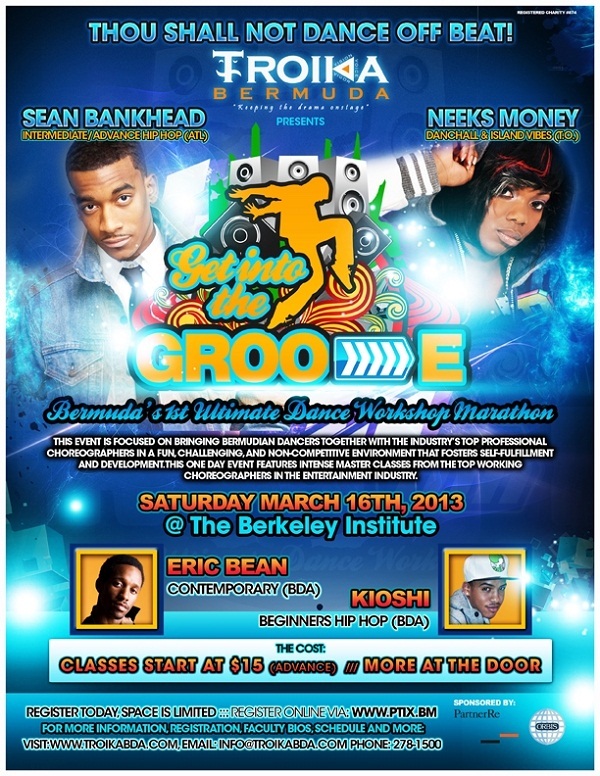 Troika Bermuda will hold an Ultimate Dance Workshop on Saturday March 16, 2013 at The Berkeley Institute. This event is focused on bringing Bermudian dancers together with the industry’s top professional choreographers in a fun, challenging, non-competitive environment that fosters self-fulfillment and development. The event will feature intense master classes from the top working choreographers in the entertainment industry. Classes will range from Hip Hop, Dancehall, Contemporary and Island Vibes. Participants will also have the opportunity to benefit from a Q&A with the faculty as well as group photo opportunities. The international instructors participating in this event include Mr. Sean Bankhead from Atlanta, Neeks Money who has worked with Rihanna, Sean Paul and Diddy. The local instructors include dancer and choreographer Eric Bean Jr. and Kioshi. Classes start at $15 in advance. The price is more at the door. Classes are limited; to avoid disappointment interested participants should register now via www.ptix.bm. There will also be an opportunity to pay at the door at an increased price. For information, registration, faculty biographies, promotional images, video footage and more please visit www.troikabda.com, email info@troikabda.com. This event was made possible by the sponsorship of Partner Re & Orbis. Target Market: Open to all ages and all levels. Event Description: This event is focused on bringing Bermudian dancers together with the industry’s top professional choreographers in a fun, challenging, non-competitive environment that fosters self-fulfillment and development. This one day event features intense master classes from the top working choreographers in the entertainment industry. Classes Offered: Hip Hop, Dancehall, Contemporary and Island Vibes. Class Time: 90 minutes in length [per class]. 4 class package $120 which is inclusive of the following classes; Contemporary, Dancehall, Intermediate/Advanced Hip Hop and Island Vibes.